Inspired by lazy days, training courses, holidays and our love of the water - we have made an elegant sterling silver sailing boat keyring. 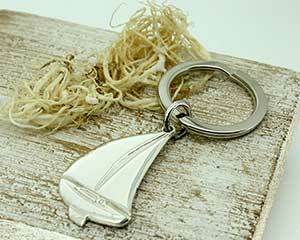 The hallmarked sterling silver sail boat keyring makes a special gift for lovers of sailing, boating and yachting. We like to think our beautiful sailing boat evokes the spirit of the sea while creating lasting memories for the owner, whether it is for yourself or a loved one - it is special.